There are always new products launched in February for the coming year from major manufacturers and this year the focus is definitely on the larger terrace and patio cover systems whether they be retractable or fixed systems. Samson Awnings specialise in retractable roof cover systems for domestic and commercial applications and with the weather seemingly getting worse demand has never been higher in the UK. This is a bit weird as for years the sales of awnings has been almost totally driven by the weather but relying on sunshine as the driving factor. It seems now however in the last 2 years this has all completely changed and we have woken up to the fact that although we do get some sunshine we spend most of our time battling with adverse weather ruining preplanned parties, barbecues and outdoor events al year round. Samson Awnings now have a solution for almost any shape or size of outdoor area requiring a fixed or retractable cover system, with or without sides infilled. The manufacturers have put most effort into the further development of larger and more stable systems capable of taking high wind speeds, heavier rain and when required snow loadings. This means we have more products than ever before to offer for your home or business to enable continued use of any area outdoors whatever the weather but with the added advantage of potential control of the roof and sides depending on wind direction, rain, sleet, snow and of course protection from the midday sun in the height of summer. 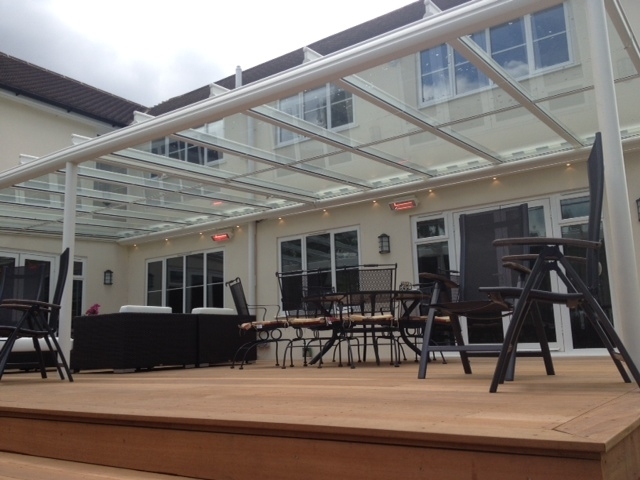 The glass veranda fixed roof system as shown above is just one example of the provision of all year round weather protection using the Weinor Terrazza.